Sometimes it becomes difficult to trace a word or text or some paragram or a location in a large document. To save your time or to easily reach directly to the specific place in the documents you can use a bookmark. Bookmark help you to identify the location in the large document Instead of searching and scrolling through a large set of texts. Let us learn How to Create or Delete Bookmark in MS Word 2016? Step 1: Open your Ms Word document in which you want to add the bookmarks. 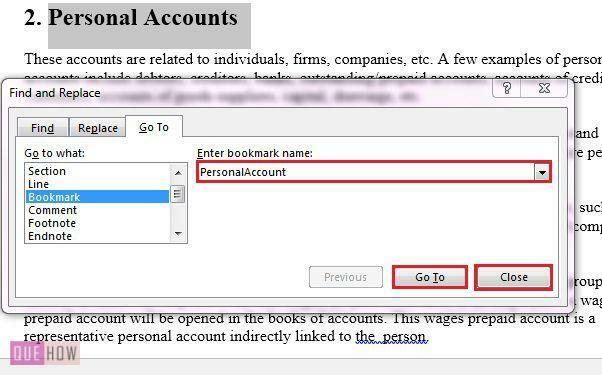 Now select the word, paragraph, object, location in the document of which you want to create a bookmark. Step 2: Go to the Insert tab, under Links group you will find a Bookmark tab click on the Bookmark. Step 3: A Bookmark dialog box will get opened. Under Bookmark name: type the name you want to assign to your bookmark. Always assign an easy name to your bookmark which also relates to the place, text, etc. where you want to jump using the bookmark. 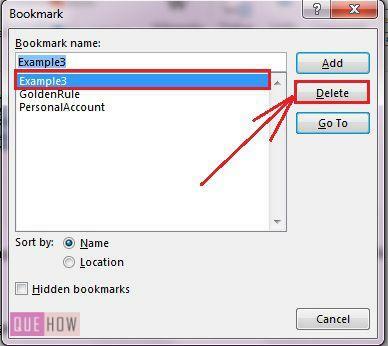 Remember Bookmark doesn’t allow any space in the Bookmark name. 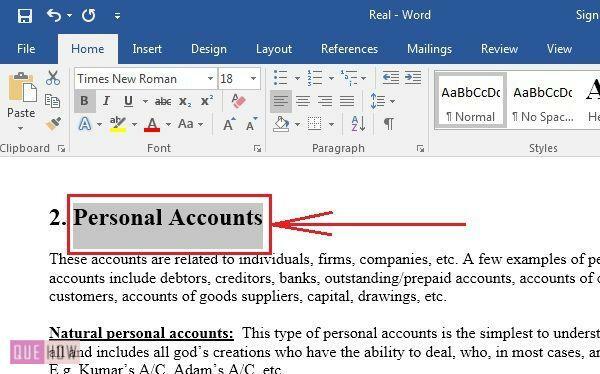 As in the image below you can see I have clubbed the words Nominal and Account as NominlAccount. At last click Add to add the name in the bookmark list. You can sort bookmark names either by location or by the name. Sorting the Bookmarks by Name will result in the names in ascending alphabetical order. 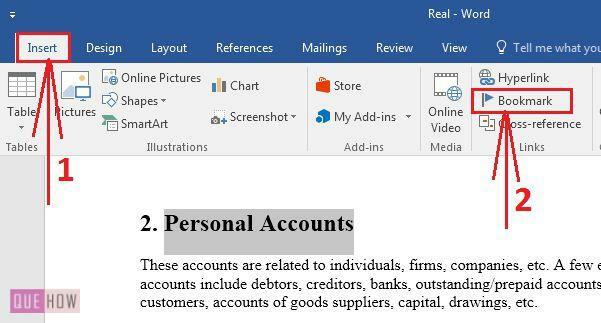 Sorting the name by Location will result the names in ascending order of position where there appear in the document. Step 4: Now its time to use the bookmark. You can use Bookmark dialog box to navigate through the document or you can use Find and Replace dialog box. You will find Find and Replace tab under the Editing group of Home tab. You can also use the shortcut Ctrl+G to open the Find and Replace dialog box. In Find and Replace dialog box under Go To tab you have a Go to what scroll box where you will find Bookmark click on that. On the right side of the dialog box, you will have an Enter bookmark name drop down box. From there you select the bookmark you want to go to and Click Go To and Close. 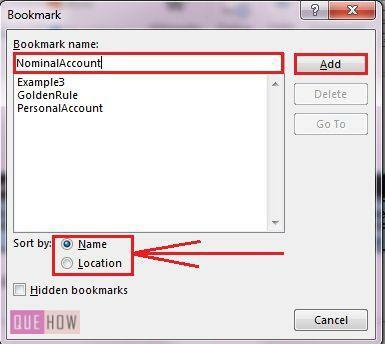 Step 5: In case if there is no use of a specific bookmark in the document you can also delete that bookmark from the list of Bookmarks. For that open, a Bookmark dialog box. Select the bookmark you want to delete from Bookmark name scroll box. and click Delete button and its done. How to Split Text in a Cell in MS Excel 2016?